Wow, that Dani Bunton comment is so wrong. Or more like, Dani is wrong. "..it only exists on long defunct hardware and it looks awful (since those machines only offered 48K of memory"
First of all, 'defunct'? My C64 and Ataris work perfectly. Nothing 'defunct' about them. Since when does C64 or Atari have only 48 k of memory? Since when does big K mean 'kilobytes'? Big K means 'Kelvin', so he's even more wrong. What computer has 48Kelvin as memory? Why does he put the 'K' right next to the number 8, instead of allowing a space? This game seems to be magnet for errors and mistakes. There is an Easter Egg for the game. • EASTER EGG: During the game, press SHIFT + OPTION. You'll see "Press START to resume play". 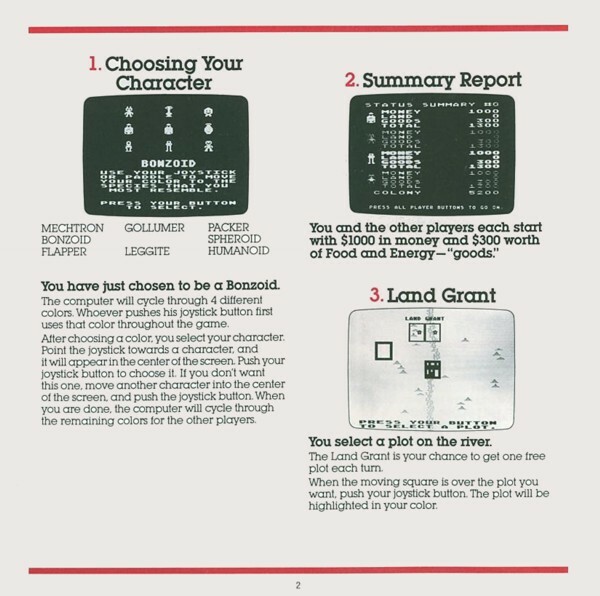 If you press SHIFT + SELECT it will say "YOU FOUND IT, DABIJIAL" (the first 2 letters of "DABIJIAL" programmers DAn Bunten, BIll Bunten, JIm Rushing, and ALan Watson. greatest original game for the atari 800. all said. Greatest 8-bit computer game ever. & Non violent. Too bad the version for dload here is messed up. Look at disk image sector number 42. "THIS IS A COPIED DISK!" with an exclamation mark to boot. This isn't even a corrupt copy, I think it's a beta version edited so it plays a joke on you. Catch the Wampus and your Atari crashes. 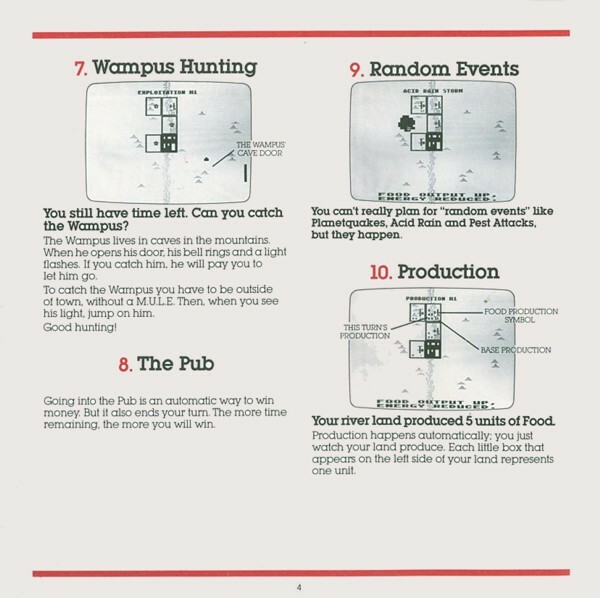 This simulates the Wampus winning it's fight with you and the glitched screen plus lock up is a portrayal of you getting eaten alive by wampus. Meanwhile Wampus is breaking into the town store and snacking on (robotic) MULEs when no one is watching (hence the glitches graphics and empty looking corral). Do a little research on games with the name "Wumpus" and you might GET the joke being played on you. 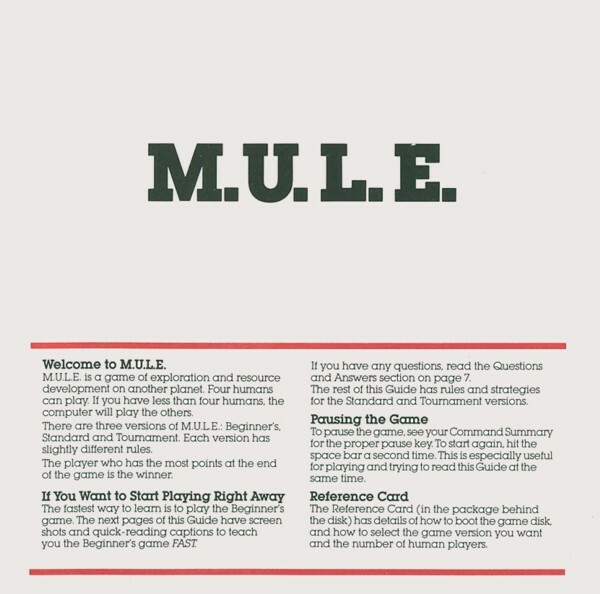 The full working version of M.U.L.E. is easily found elsewhere. Though maybe still copyrighted. Anyway go visit www.ozarksoftscape.com and buy a cool retro T-shirt and tell them to make coffee mugs too. 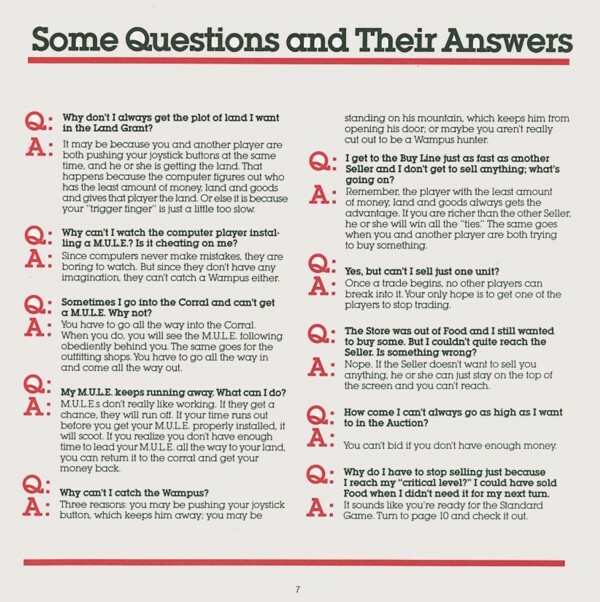 The video tutorial on "www.planetmule.com" still applies to this original version and its new music track is killa. 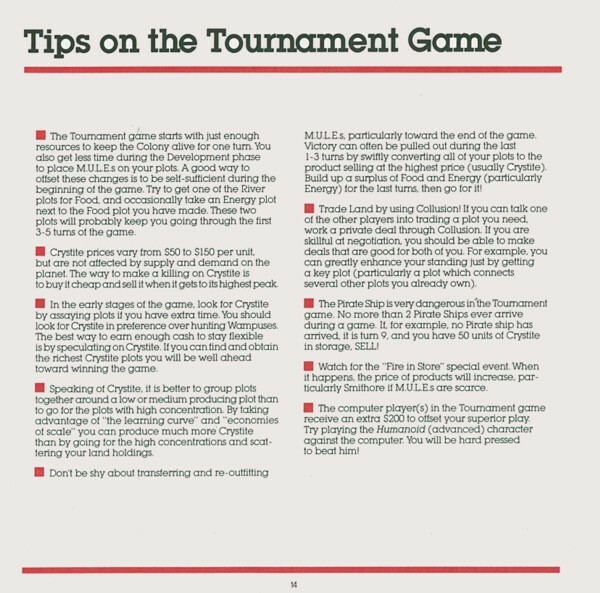 Play on tournament mode. Best played with a friend or 3 friends if you have an Atari 800 or multijoy. It's a superb fun game and fairly easy going. I could never understand this game. I never had it as a kid, and now suddenly trying to get into it, seems impossible. I hear it's some kind of trading game (I never understood how that could be even theoretically fun - I also don't understand why people love the game 'Elite' so much, when it has to do with trading - I guess I just don't understand trading, to me it looks just as exciting as worrying about stock markets in a Superman game), or something. 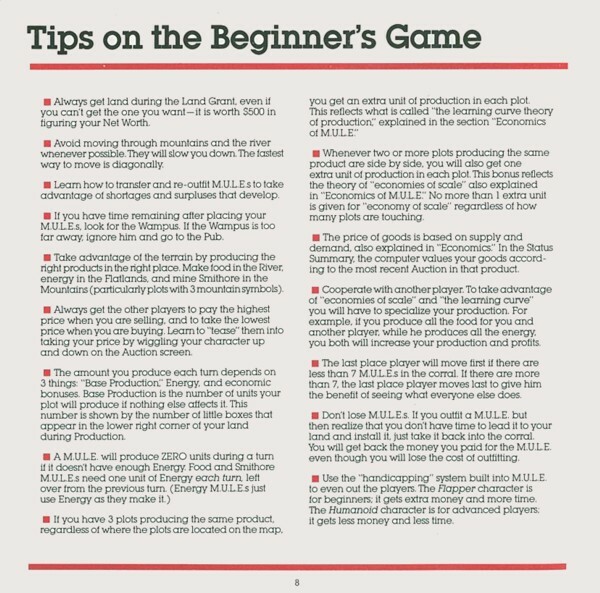 I guess even if I understood how to play, I probably wouldn't find it fun, because even the idea of trading is extremely boring to me, and I can't fathom why or how anyone would find it exciting. It's like accounting - who finds accountant's work somehow exciting or fun? But this Atari version has a great title screen and raster effects, together with a rhythmic song, which is why I sometimes load this up and just watch and listen to the title screen. I wish a whole 'movie' would be made like that - with this kind of graphics just happening on the screen, and telling some interesting story. Hopefully not about trading, though. Perhaps there's something I just don't understand or know about this game, because so many seem to find this somehow so fun. It's puzzling. I prefer games like 'Maniac Mansion', Project:Stealth Fighter, California Games, International Karate and on the Atari side, Blue Max, H.E.R.O. and the like. I just can't see ever thinking that 'trading' is fun in any way. 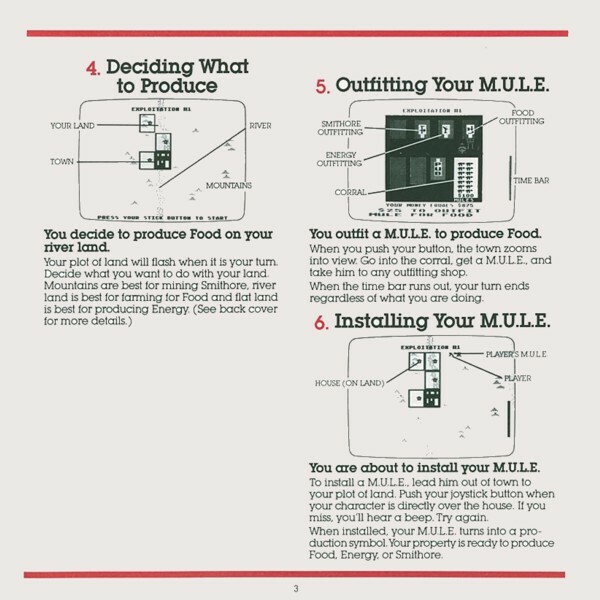 MULE without the Wampus?!? :o Ok, clearly I'm dealing with a madman. W - I'm not getting those errors. The only one I'm getting is catching the wampus as it does crash when you do. However I'm not too fussed about that. The dump image for this game (both the US and UK versions) is broken. Weird artifacting and missing graphics (like in the store, with no mules visible), and crashes if you catch the wampus. Can't believe no one has mentioned or noticed this. Amazing game. Make the very short list of greatest all time. The greatest video game ever made for the Atari 800. Whenever I see a new computer or game console, the first question in my head: Can this baby run 4-player MULE? It's worth getting yourself an Atari 800 (or a Sega Dreamcast, cough, ahem) just to play this. Double Bragging Rights if you have this game in its original "record album" packaging. EA had such terrific covers for their games back in 1983. One of the best multi-player computer games EVER. RIP Dani Bunten. My favorite game ever. Nice graphics (and music) and a design that encourages cooperation. If you do not try to gobble up a certain resource (like smithore), the robots will behave more or less decently. I regularly win, and the colony makes 70,000 points or more, when I do not try to monopolize a resource. Some emulators (like atai800 under linux) are a little slow, even on a 64 bit computer. Again, some emulators have a switch that allows you to use real-time emulation. I love the music, and it sounds ok only with r/t emulation on. Well, here we go again. 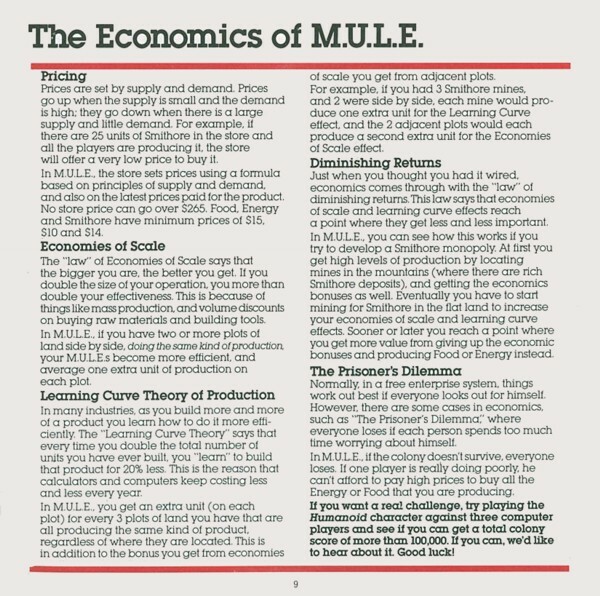 M.U.L.E. sold today without packaging, even in the wrong sleeve,with no guarantee it will work for $179.00 on eBay. It just shows one more time that there are folks who regard this game as legend. They right! 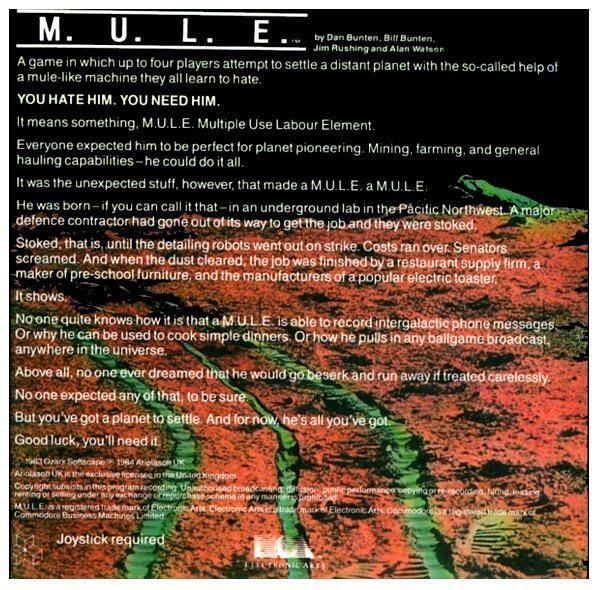 By the way, an oddity is that the cycling of colors and hues in the opening screen within the word M.U.L.E. 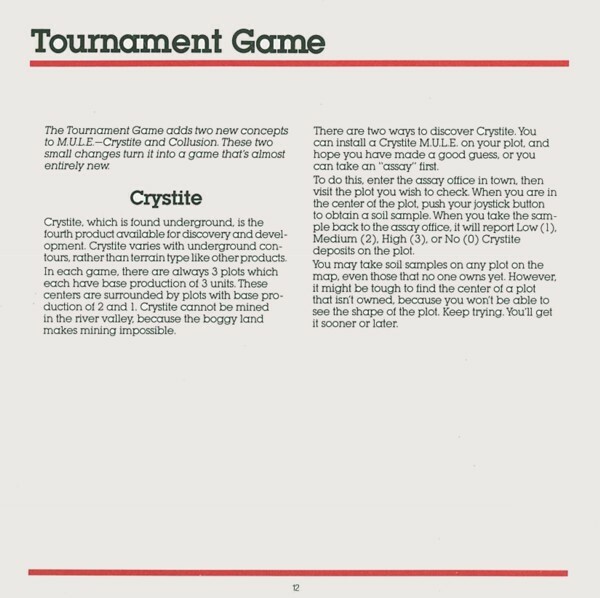 uses GTIA graphics which replaced the CTIA graphics on earlier Atari 800's. I think I'll go to my 800 and boot this bugger up just to hear the music, and let the computer play itself. Even THAT is fun! What a marvelous piece of history nearly 30 years old! Thanks again, Dan(i) wherever you are. 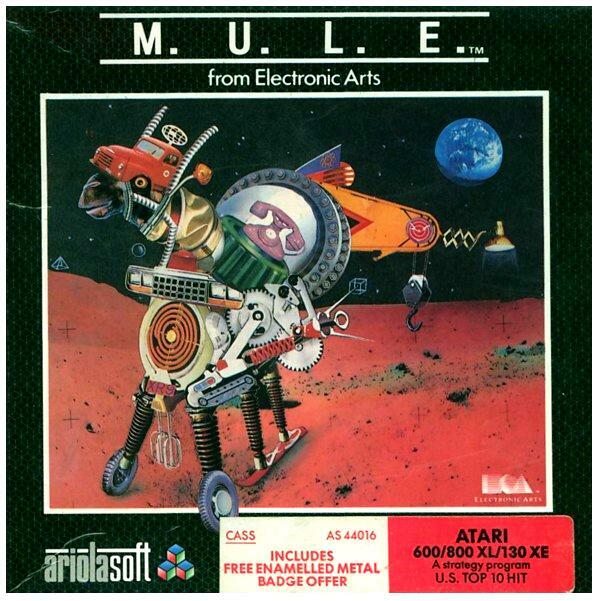 An unopened copy of M.U.L.E. sold on eBay last week for over $300.00!!! 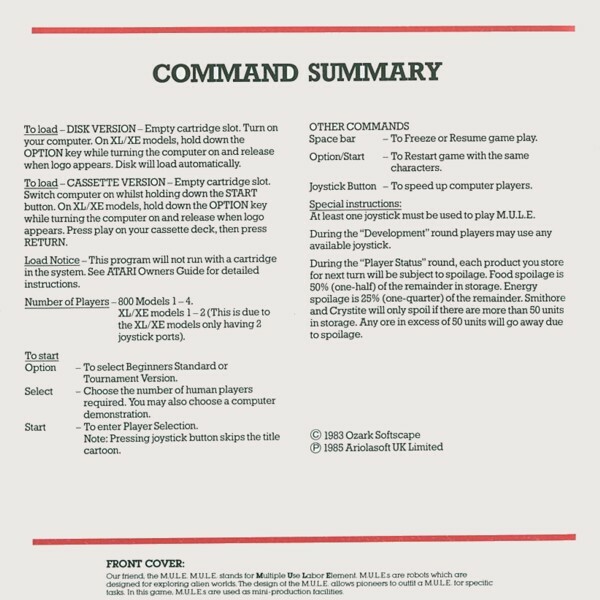 It's worth it because this game is the best multiplayer game ever made for the Atari computer. 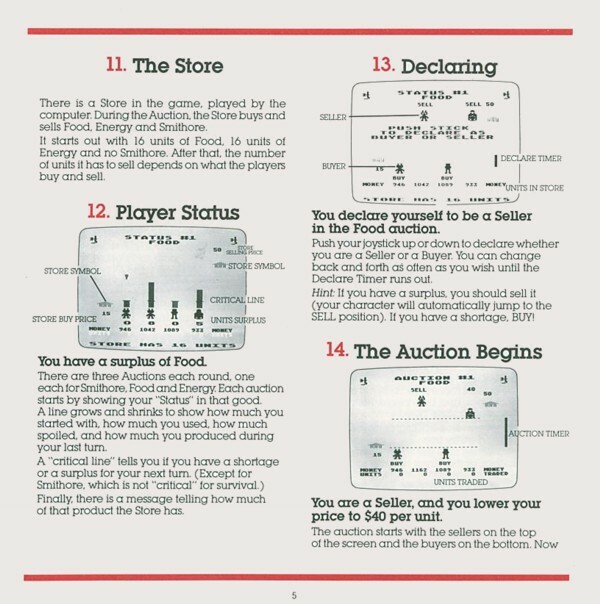 My sons and I used to have a ball playing this together, and what a great learning tool!!! If you've got a youngster who you believe could be a C.E.O. (or even C.F.O.) someday, then this is the game for you. Bunten was a true gift to the 'industry', and his/her presence is sorely missed. 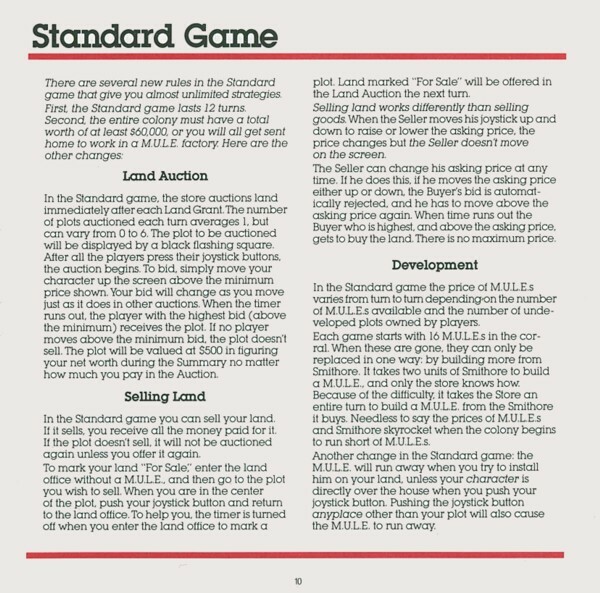 Buying an Atari 800 off eBay is worth it just to play this game. 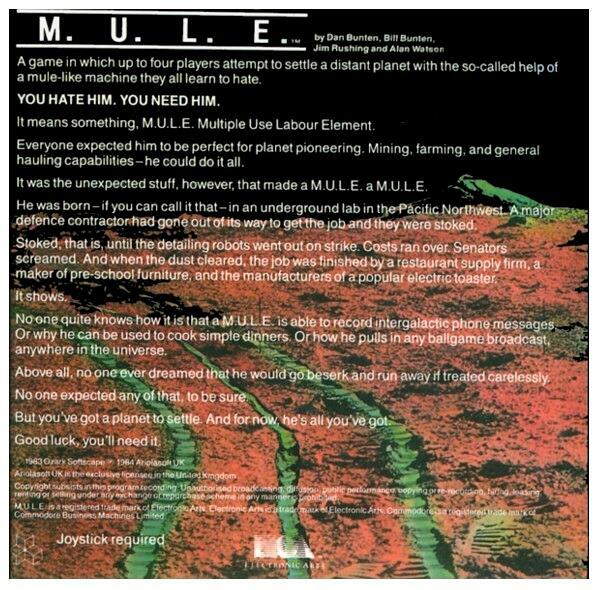 But don't pay $300.00 for a copy of M.U.L.E. unless you already own a Lamborghini! Couldn't get my brother off this one. It's a good, fun game in itself when you play it on your own, but when there's two or more of you playing it comes into it's element. Then the trading becomes much more interesting as you charge the earth for your fellow competitors to get what they need. It's ruthless! 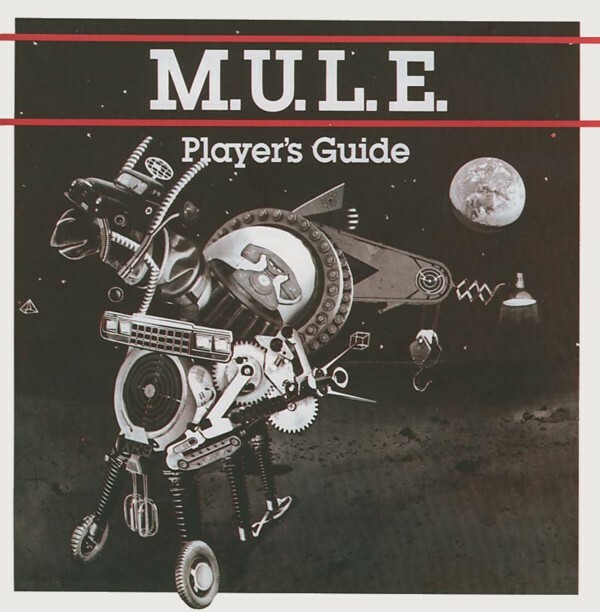 Check out the very nice (unofficial) sequel called Mule Wars. 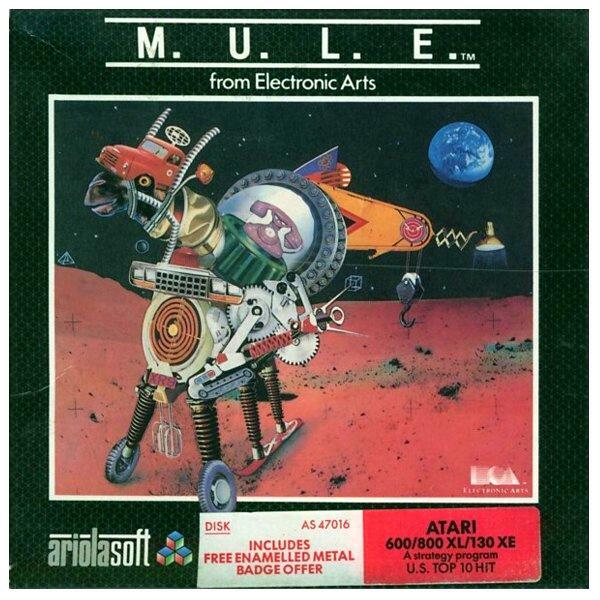 MULE was part of the group of games that launched Electronic Arts in '83. 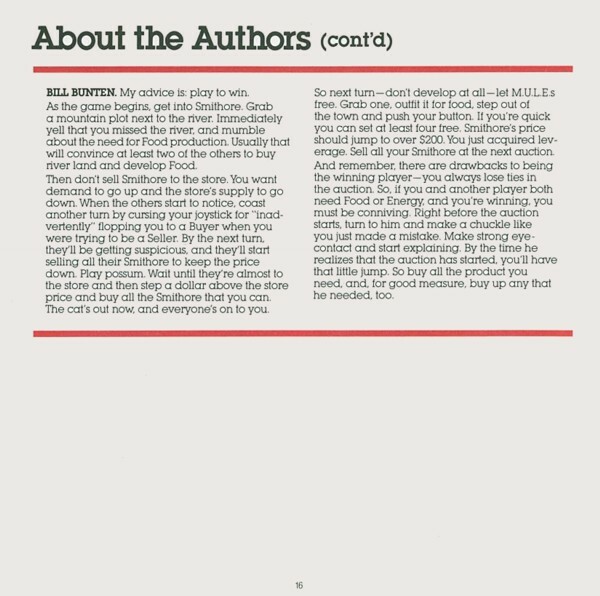 It won numerous awards (including Computer Gaming World's Hall of Fame) and sold reasonably well (despite being the "most pirated game" at the time according to the publisher of the magazine). Curiously, it happened as a result of the fact that Trip Hawkins (the founder of EA) couldn't get SSI to sell him Cartels and Cutthroats. I convinced him we (at that point I had formed Ozark Softscape and had five employees) could do it better. 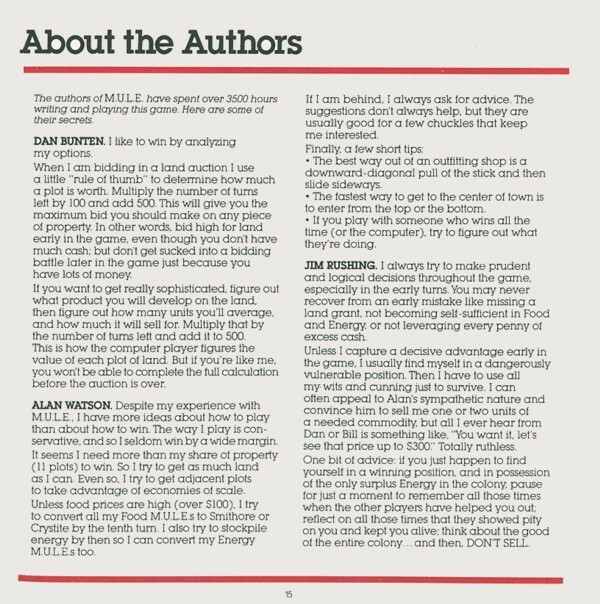 I took the auction from Wheelers, the graphic real-time aspects from Cytron Masters, some of the production ideas from Cartels and let it evolve where it needed to. This was the game that taught me the value of play-testing where you watch and talk to real people about the game while it's under development. After all, games are a form of communication that can only be confirmed by checking whether it works against an audience. A couple of design pieces really pleased me about this game. I think the auction with the sellers on top and the buyers on the bottom of the screen and a timer was particularly cool. 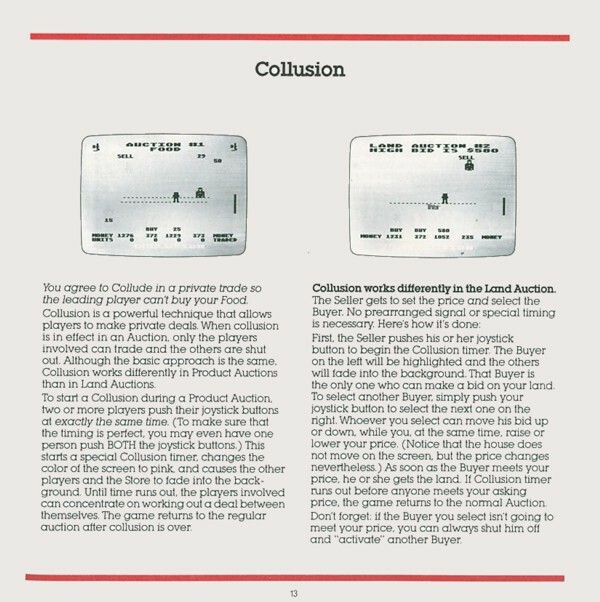 Sellers would walk down the screen thereby lowering the price they were offering to sell at and buyers would walk up the screen raising their bid. When the two met, units of commodity would zip from the seller to the buyer. This led to a lot of dickering and cajoling by the players trying to get each other to move closer using all types of justifications to support their inability to move themselves. When the timer started running down, this could lead to a lot of frantic maneuvering. 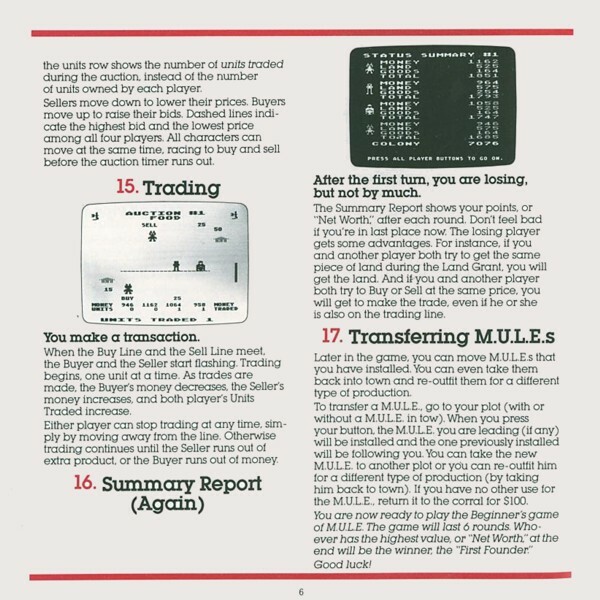 Another neat thing was the invention of the MULE itself. 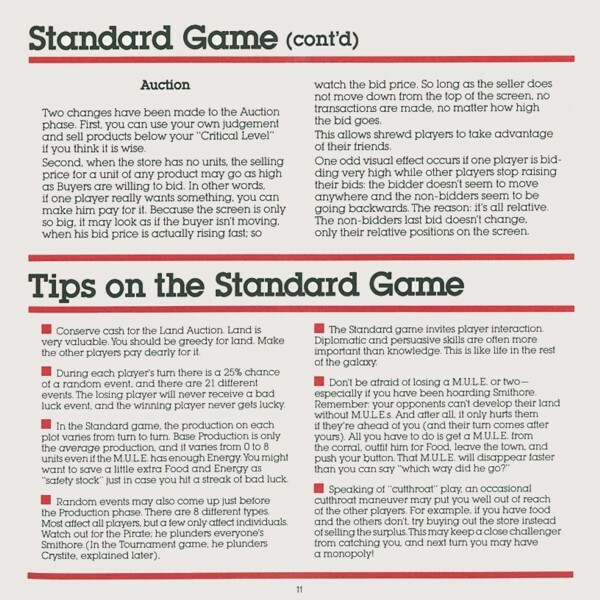 In order to make the auctions interesting, there had to be commodities that players needed and also made (so some became sellers and others buyers). 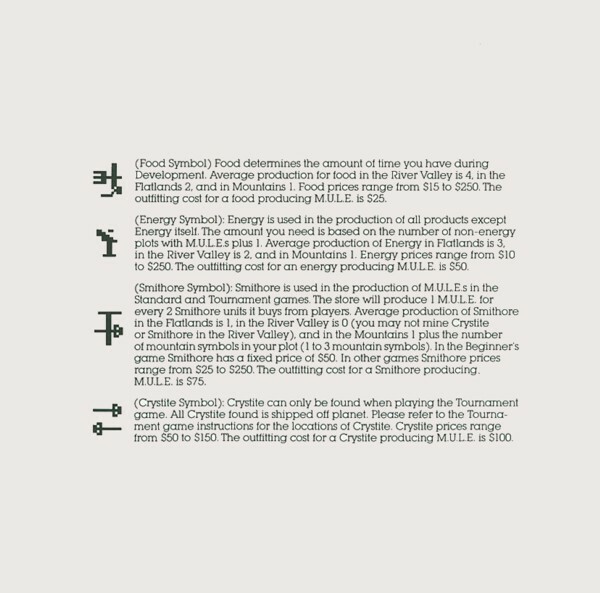 From a strategic game model, what was needed was some way for players to say "I want to produce commodity A on plot X" but text entry or even menu selection seemed uninteresting. What if you picked up a machine somewhere and dragged it to your property to produce what you wanted. This "machine" eventually became a "Multiple Use Labor Element" that you got from the coral in the town, dragged into an outfitter shop of the right kind for the commodity you wanted and took out to your land and deposited there. Voilà, we had the info the model needed and with the addition of a timer, we had an interesting play element. My only disappointment with the game is that it only exists on long defunct hardware and it looks awful (since those machines only offered 48K of memory and I used it mostly for program rather than graphics). I almost got a SEGA Genesis version through EA in '93 but at the alpha phase, they insisted on adding guns and bombs (or something similar) to "bring it up to date". I was unable to comply. I'm still amazed at how well loved it is (there are a number of web sites devoted to it) and I'm hopeful I can find a way to bring it to life again - possibly on the Internet.